Georgia's Home Inspirations: Homemade Vegetable Beef Soup! When it's overcast, damp and downright chilly, we all start thinking soup for dinner. There are a lot of very good commercial soups to choose from, but nothing beats homemade when it comes to health and nutrition. You get to control the ingredients, especially the salt! This quick and easy recipe for vegetable beef soup comes to you from my dad. You can vary the ingredients so that everyone is happy and satisfied. If you have a vegetarian in the family like I do, just use vegetable stock and add the meat to each bowl when served. As with all homemade soups, sauces and gravies, this tastes even better the next day and freezes well. Melt butter in 6 quart saucepan and saute onion, celery and carrot until softened. Meanwhile, in a separate saucepan, brown ground beef, cubed stew beef or cubed chicken. Set aside. Add mixed cut vegetables to the pan. I used a bag of frozen peas, corn, green beans and carrots and then added a cup of frozen lima beans. This is completely your choice. Add more or less vegetables according to taste. More vegetables will give you a stew-like consistency. Add broth and water to the saucepan. Next, add in the potato and tomato. Everything is added immediately in this recipe. Finally, add in spices and salt to taste. 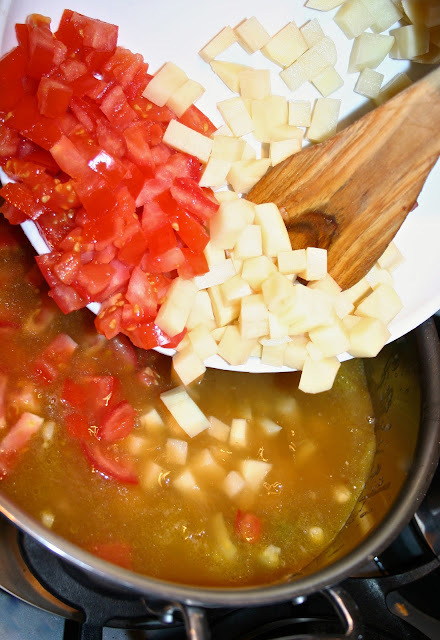 Simmer until vegetables are tender (approximately an hour). Serve with grated parmesan cheese and, of course, hot rolls! Enjoy!